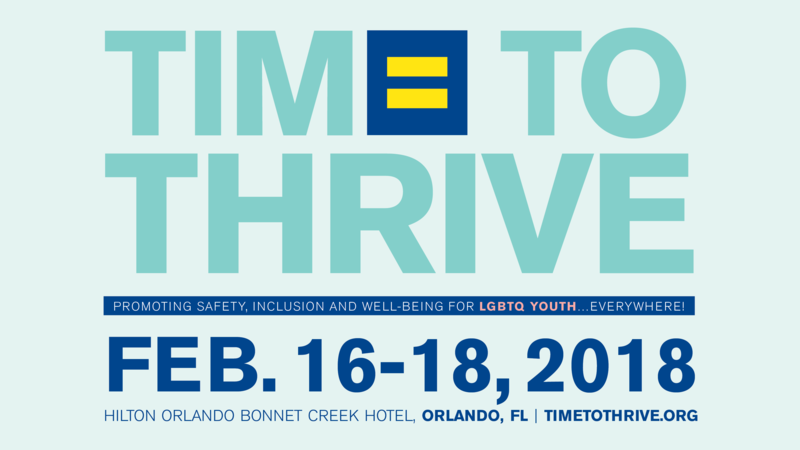 The HRC Foundation, in partnership with the National Education Association (NEA) and the American Counseling Association (ACA), will hold its nationally-acclaimed Time to THRIVE Conference February 16-18 at the Hilton Orlando Bonnet Creek in Orlando. Toyota will again be a presenting sponsor. In its fifth year, this premier event of the HRC Foundation, HRC's educational arm, will address the safety, inclusion and well-being of LGBTQ and questioning youth. The event brings together a wide range of youth-serving professionals to discuss best practices for working with and caring for LGBTQ youth and their families in schools, community centers, health care settings and beyond. HRC’s Time to THRIVE is the premier national convening of educators and youth-serving professionals to build awareness and cultural competency, learn current and emerging best practices, and gather resources from leading experts and national organizations in the field. To register, visit www.TimeToThrive.org. HRC Foundation is also accepting Time to THRIVE workshop proposals. Click here to download a save the date flyer.